The exponential growth of the human population could lead to food shortages, global warming, and other issues of resource scarcity. Global human population growth is around 75 million annually, or 1.1% per year. The global population has grown from 1 billion in 1800 to 7 billion in 2012. Although the direst consequences of human population growth have not yet been realized, exponential growth cannot continue indefinitely. In the late 1970s, China’s “one-child” policy tried to control population growth, but restrictions were relaxed in the early 2000s. One of the major consequences of population growth is the potential for widespread food shortages. Most scientists agree that humans and human population growth are causing climate change by emission of the greenhouse gas carbon dioxide (CO2). International treaties to limit greenhouse gas emissions have not been ratified by every country due to economic and political concerns. greenhouse gas: Any gas, such as carbon dioxide, that contributes to the greenhouse effect (continued warming) when released into the atmosphere. climate change: Changes in the earth’s climate, especially those said to be produced by global warming. Global human population growth is around 75 million annually, or 1.1% per year. The global population has grown from 1 billion in 1800 to 7 billion in 2012. It is expected to keep growing, though predictions differ as to when and if this growth will plateau. 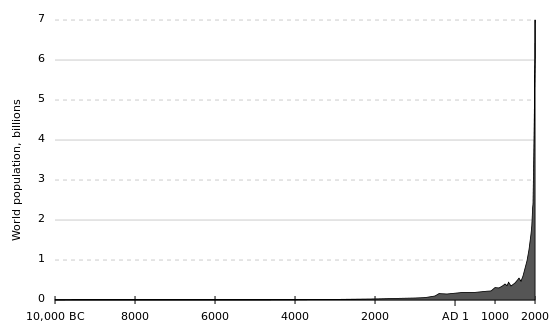 The estimated growth of the human population from 10,000 BCE–2000 CE. : The human population has grown most sharply in the past 200 years. Globally, the growth rate of the human population has been declining since 1962 and 1963, when it was 2.20% per annum. In 2009, the estimated annual growth rate was 1.1%. The CIA World Factbook gives the world annual birthrate, mortality rate, and growth rate as 1.89%, 0.79%, and 1.096% respectively. The last 100 years have seen a rapid increase in population due to medical advances and massive increase in agricultural productivity. rather, it means the population is growing more slowly. However, some countries do experience negative population growth, mainly due to low fertility rates, high death rates and emigration. According to the UN’s 2010 revision to its population projections, world population will peak at 10.1 billion in 2100 compared to 7 billion in 2011. However, some experts dispute the UN’s forecast and have argued that birthrates will fall below replacement rates (the number of births needed to maintain a stable population) in the 2020s. According to these forecasters, population growth will be only sustained until the 2040s by rising longevity, but will peak below 9 billion by 2050, followed by a long decline. Growing Population Rate and Resource Scarcity: Greater Los Angeles lies on a coastal Mediterranean Savannah with a small watershed that is able to support at most one million people on its own water; as of 2015, the area has a population of over 18 million. Researchers predict that similar cases of resource scarcity will grow more common as the world population increases. The “population explosion” seen in the last century has led to dire predictions. In 1968, biologist Paul Ehrlich wrote, “The battle to feed all of humanity is over. In the 1970s, hundreds of millions of people will starve to death in spite of any crash programs embarked upon now. At this late date, nothing can prevent a substantial increase in the world death rate. ” Although many critics view Ehrlich’s view as an exaggeration, the human population continues to grow exponentially. The laws of nature dictate that exponential growth cannot continue indefinitely. Despite efforts to curb population growth, such as the “one-child policy” in China (introduced in 1979 but relaxed in the early 2000s), the human population continues to grow. A primary concern regarding this growth is that the demand for ever-more food will lead to widespread shortages, as forecast by Ehrlich. World population growth from 1800 to 2100: United Nations projections in 2010 give “high” (red line), “medium” (orange) and “low” (green) scenarios for world population growth. The highest estimate projects the world population may rise to 16 billion by 2100 or it may decline to 6 billion, according to the lowest estimate. In addition to the threat of food shortages, human population growth is damaging to the environment in potentially permanent ways. Most scientists agree that climate change caused by the emission of the greenhouse gas carbon dioxide (CO2) is a significant consequence of human activities. In a series of treaties in the late 20th century, many countries committed to reducing their CO2 emissions to prevent continuous global warming; however these treaties have not been ratified by every country, largely due to economic and political concerns. The role of human activity in climate change is hotly debated in some circles. The future holds considerable uncertainty for curbing human population growth and protecting the environment. Humans have exceeded density-dependent limits on population by enacting various environmental changes to accommodate our needs for hygiene, shelter, and food. Humans’ ability to alter their environment is an underlying reason for human population growth, enabling people to overcome density-dependent limits on growth, in contrast with all other organisms. Abilities, such as construction of shelter, food cultivation, and the sharing of technology, have helped humans overcome factors that would have otherwise limited their population growth. Originating from Africa, human migration to nearly every inhabitable area of the globe has enabled colonization of areas where people were previously absent. Advances in medicine, notably vaccines and antibiotics, as well as improvements in nutrition and vector control, have significantly curbed mortality from disease. density-dependent: Processes that occur when population growth rates are regulated by the size of a population in a given amount of resources such as food or habitat area. vaccine: A substance given to stimulate the body’s production of antibodies and provide immunity against a disease, prepared from the agent that causes the disease, or a synthetic substitute. infectious disease: Illness caused by introduction of a pathogen or parasite into the body via contact with a transmitting agent such as vector organism or an infected person. Humans are uniquely able to consciously alter their environment to increase its carrying capacity. This capability is an underlying reason for human population growth as humans are able to overcome density-dependent limits on population growth, in contrast with all other organisms. Human intelligence, society, and communication have enabled this capacity. For instance, people can construct shelters to protect them from the elements; food supply has increased because of agriculture and domestication of animals; and humans use language to pass on technology to new generations, allowing continual improvement upon previous accomplishments. Migration has also contributed to human population growth. Originating from Africa, humans have migrated to nearly every inhabitable area on the planet. Public health, sanitation, and the use of antibiotics and vaccines have lessened the impact of infectious disease on human populations. In the fourteenth century, the bubonic plague killed as many as 100 million people: between 30 to 60 percent of Europe’s population. Today, however, the plague and other infectious diseases have much less of an impact. Through vaccination programs, better nutrition, and vector control (carriers of disease), international agencies have significantly reduced the global infectious disease burden. For example, reported cases of measles in the United States dropped from around 700,000 a year in the 1950s to practically zero by the late 1990s. Globally, measles fell 60 percent from an estimated 873,000 deaths in 1999 to 164,000 in 2008. This advance is attributed entirely to a comprehensive vaccination program. 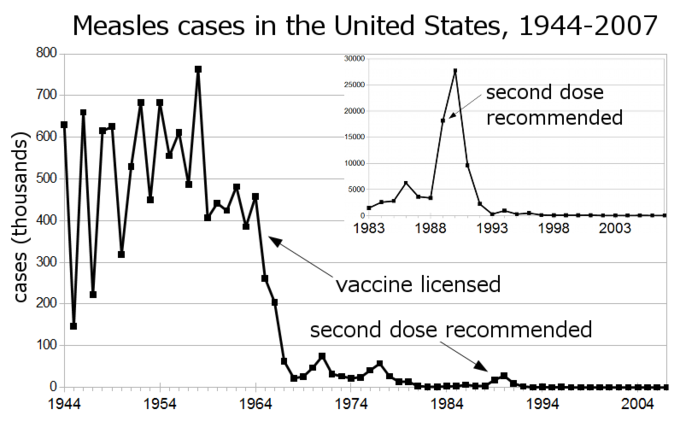 Measles cases reported in the United States, 1944-2007: Measles cases reported in the United States, represented as thousands of cases per year, declined sharply after the measles vaccine was introduced, in 1964. Developing countries have also made advances in curbing mortality from infectious disease. For example, deaths from infectious and parasitic diseases in Brazil fell from second place as the most important causes of death in 1977 to fifth place in 1984. The improvement is attributed in part to increased access to essential goods and services, reflecting the country’s rising prosperity. Through changes in economic status, as in Brazil, as well as global disease control efforts, human population growth today is less limited by infectious disease than has been the case historically. 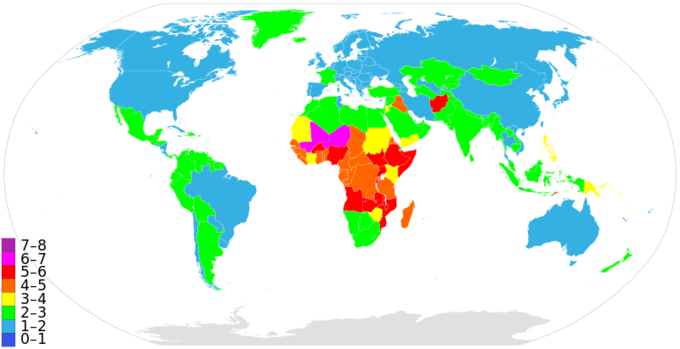 Countries by Fertility Rate Comparison: The advent of modern medicine is very closely tied to childhood mortality, as well as the number of children per mother (Fertility Rate). As modern medicine decrease child mortality, the birth rate decreases. A population’s growth is strongly influenced by the proportions of individuals in different age brackets, which in turn is influenced by economic development. Population dynamics are influenced by age structure, which is characteristic for populations growing at different rates. Age structure varies according to the age distribution of individuals within a population. Fast-growing populations with a high proportion of young people have a triangle-shaped age structure, representing younger ages at the bottom and older ages at the top. Slow-growing populations with a smaller proportion of young people have a column-shaped age structure, representing a relatively even distribution of ages. Improvements in health care have led to the population explosion in underdeveloped countries, causing a “youth bulge” which is associated with social unrest. population dynamics: Variation among populations due to birth and death rates, by immigration and emigration, and concerning topics such as aging populations or population decline. youth bulge: Age structure typical of fast-growing populations in which a majority of the population are relatively young. age structure: The composition of a population in terms of the proportions of individuals of different ages; represented as a bar graph with younger ages at the bottom and males and females on either side. The variation of populations over time, also known as population dynamics, depends on biological and environmental processes that determine population changes. A population’s growth rate is strongly influenced by the proportions of individuals of particular ages. With knowledge of this age structure, population growth can be more accurately predicted. Age structure data allow the rate of growth (or decline) to be associated with a population’s level of economic development. For example, the population of a country with rapid growth has a triangle-shaped age structure with a greater proportion of younger individuals who are at or close to reproductive age. This pattern typically occurs where fewer people live to old age because of sub-optimal living standards, such as occurs in underdeveloped countries. Population bar graphs for stages of demographic change from expansion to contraction: The leftmost diagram (representing the age structure of a rapidly-growing population) indicates that the number of individuals decreases rapidly with age. The slow-growth model shows that the proportion of individuals decreases steadily with age. The stable population diagram is rounded on top; the older part of the population is a larger proportion of the population than in the other age diagrams. The rightmost diagram represents a population that may be stable or even declining. The relatively few young people may not be making up for the mortality among the older age groups. Changing Population Age Structure: This 3:28 minute movie discusses age structures and gives examples. Some developed countries, including the United States, have a slowly-growing population. This results in a column-shaped age structure diagram with steeper sides. In these cases, the population has fewer young and reproductive-aged individuals, with a greater proportion of older individuals. Some developed countries, such as Italy, have zero population growth. Countries with declining populations, such as Japan, have a bulge in the middle of their age structure diagram. The bulge indicates relatively-few young individuals, and a higher proportion of middle-aged and older individuals. Globally, less-economically developed countries in Africa and Asia have the highest growth rates, leading to populations consisting mostly of younger people. Improved health care, beginning in the 1960s, is one of the leading causes of the increased growth rates that created the population explosion. For example, in the Middle East and North Africa, around 65 percent of the population is under the age of 30. These high growth rates lead to the so-called “youth bulge,” which some experts believe is a cause of social unrest and economic problems such as high unemployment. Global percent growth rate of population: The percent growth rate of population in different countries shows that the highest growth rates are in underdeveloped regions of Africa and Asia. All of the factors above also have an impact on the average life expectancy. As economic development and quality of health care increase, the life expectancy also increases. Worldwide Life Expectancy by Country: 2012 map showing average life expectancy by country in years. In 2012, the World Health Organization estimated the average global life expectancy as 70.5 years.